A new bacterial blight recessive resistance gene xa34(t) was identified from the descendant of somatic hybridization between an aus rice cultivar (cv.) BG1222 and susceptible cv. IR24 against Chinese race V (isolate 5226). The isolate was used to test the resistance or susceptibility of F1 progenies and reciprocal crosses of the parents. The results showed that F1 progenies appeared susceptibility there were 128R (resistant):378S (susceptible) and 119R:375S plants in F2 populations derived from two crosses of BG1222/IR24 and IR24/BG1222, respectively, which both calculates into a 1R:3S ratio. 320 pairs of stochastically selected SSR primers were used for genes’ initial mapping. The screened results showed that two SSR markers, RM493 and RM446, found on rice chromosome 1 linked to xa34(t). Linkage analysis showed that these two markers were on both sides of xa34(t) with the genetic distances 4.29 and 3.05 cM, respectively. The other 50 SSR markers in this region were used for genes’ fine mapping. The further results indicated that xa34(t) was mapped to a 1.42 cM genetic region between RM10927 and RM10591. 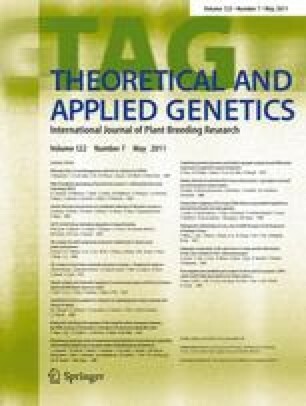 In order to further narrow down the genomic region of xa34(t), 43 of insertion/deletion (Indel) markers (BGID1-43) were designed according to the sequences comparison between japonica and indica rice. Parents’ polymorphic detection and linkage assay showed that the Indel marker BGID25 came closer to the target gene with a 0.4 cM genetic distance. A contig map corresponding to the locus was constructed based on the reference sequences aligned by the xa34(t) linked markers. Consequently, the locus of xa34(t) was defined to a 204 kb interval flanked by markers RM10929 and BGID25. S. Chen and X. Liu contributed equally to this work. We thank Dr. John Pinar in South China Normal University for his critical revision of the manuscript. This research was supported by the Earmarked Fund for Modern Agro-Industry Technology Research System, the Commonweal Vocation (Agriculture) Scientific Research Special Foundation (nyhyzx07-056) and the Fundamental Science Foundation of Guangdong Academy of Agricultural Sciences (07-JC-05).